Watertown is a city in Middlesex County, Massachusetts, United States. It is part of the greater Boston area. The population was 31,915 at the 2010 census. 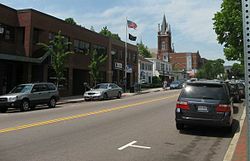 Watertown is one of fourteen Massachusetts municipalities that have been granted city forms of government but kept the name town. The area of Watertown was inhabited for thousands of years before the arrival of settlers from England. The tribes of the Pequossette and the Nonantum, had settlements on what is now called the Charles River. The Pequossette built a fishing weir to trap herring. This was at the site of the current Watertown Dam. Every year the alewife and blueback herring swim upstream from their adult home in the sea. this is to spawn in the fresh water where they came from. The first settlement of Watertown was at the Saltonstall Plantation in 1630. This was one of the earliest of the Massachusetts Bay settlements. It was begun by a group of settlers led by Richard Saltonstall and the Rev. George Phillips. It was officially incorporated that same year. The alternate spelling "Waterton" is seen in some early documents. The first buildings were on land that is now in the city of Cambridge. It was known as Gerry's Landing. For its first quarter century Watertown ranked next to Boston in population and area. Since then its city limits have been greatly reduced. The Stanley Brothers built the first of their steam-powered cars, called Stanley Steamers, in Watertown in 1897. ↑ "Massachusetts City and Town Incorporation and Settlement Dates". William Francis Galvin, Secretary of the Commonwealth of Massachusetts. Retrieved 24 August 2014. ↑ City of Watertown official website, "History and Tourism"
This page was last changed on 10 July 2018, at 20:15.